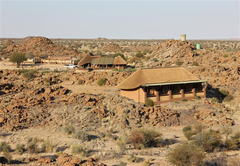 Plato Lodge is a highly recommended Northern Cape game lodge providing a wildlife experience for discerning tourists visiting Green Kalahari. 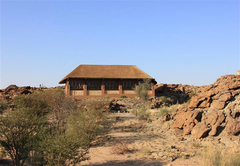 Plato Lodge is situated 50km west from Augrabies Waterfalls Natural Park. 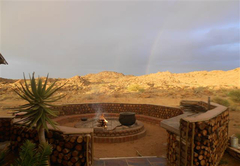 It is ideal for the visitor who wants to explore the waterfalls at Augrabies, the Richtersveld, West Coast, Namaqualand flower season and Namibia. 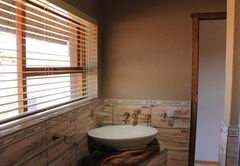 Accommodation consists of five double bedrooms (twin beds on request) with double showers and a balcony. Rooms look onto the mountains, to the river and up again to the point where the plateau forms the background (it is an unbelievable view). 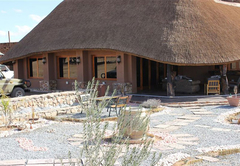 The lodge uses solar power and is as environmentally friendly as possible. Plato Lodge is ideal for the guest who is brain tired and wants a break from the rush of the modern world. Breakfast is included and dinner is served on request. Guests also have the option of braaing for themselves. 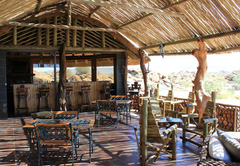 There are bar facilities in the main lodge and mini bars are provided in the rooms. 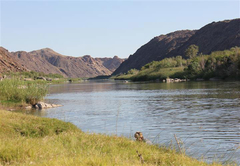 Activities on Plato Lodge include sand-duning, both fly and normal fishing, game drives, walking and mountain bike trails (there are 5km, 10km, 14km, 20km and a 26km routes), 4 x 4 route, stargazing, photographing, picnics at the riverfront and a full moon walking experience. 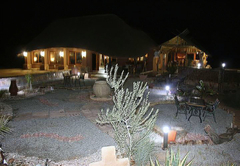 Plato Lodge is 110km from Pofadder and +- 90km from the Onseepkans border post. 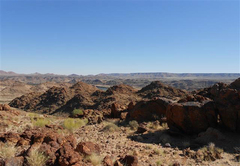 The area is a semi-desert with a beautiful Orange River front and sand dunes. 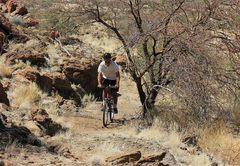 The quiet, safety and remoteness of the area gives you the feeling of rest and peace. 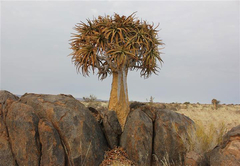 Wildlife on the 9000ha farm includes eland, kudu, oryx, springbok, steenbok and klipspringer. 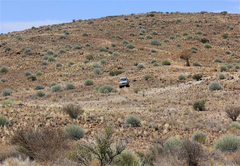 In this area the leopard is still in the wild and 65 000ha (which includes Plato Lodge) is a leopard reserve. Bird life includes the Black Eagle, Fish Eagle, Peacock, Namaqwaland, Dubbelband Patrys etc. 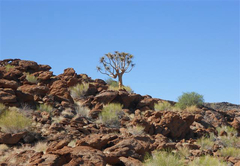 The Fauna is rich in semi desert species like the quiver tree, Shephard tree, Black Ebany, Camel tree etc. 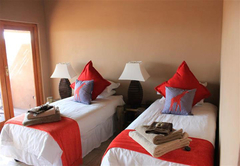 Accommodation consists of five double bedrooms (twin beds on request) with double showers and a balcony. Rooms look onto the mountains, to the river and up again to the point where the plateau forms the background (it is an unbelievable view). 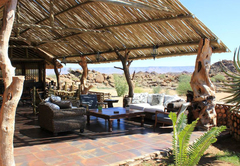 ; ; The lodge uses solar power and is as environmentally friendly as possible. Plato Lodge is ideal for the guest who is brain tired and wants a break from the rush of the modern world. 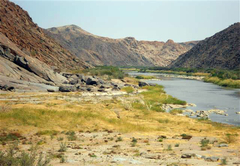 It was my first visit to Augrabies Falls. I stayed for three nights at Plato Lodge. The hospitality of Lea and Eugene was outstanding, The food exquisite. The rocky scenery surrounded the Lodge are to beautiful to describe in words. 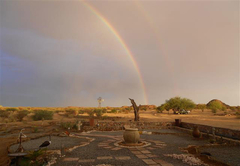 If you want to break away and are looking for peace and quietness then Plato Lodge is the place to visit.